In the parish cemetery in Dołha there took place an unveiling ceremony next to the graves of Poles assisting Jews during the Holocaust. The Lasting Memory Foundation set up a memorial plaque over the grave of Wojciech Pachurka killed by the Germans in 1943 for assisting the Jews from Puchacze. In July 2016 the Yad Vashem Institute in Israel recognized him as the Righteous Among the Nations of the World. In Puchacze three memorial stones erected by The Lasting Memory Foundation were unveiled in the places of the execution and burial of 23 Jews murdered by the Germans during the war. The victims were residents of Puchacze – 4 families, including 14 children. We engraved their names on the memorials. The residents of Puchacze and the ceremony guests paid tribute to the dead. 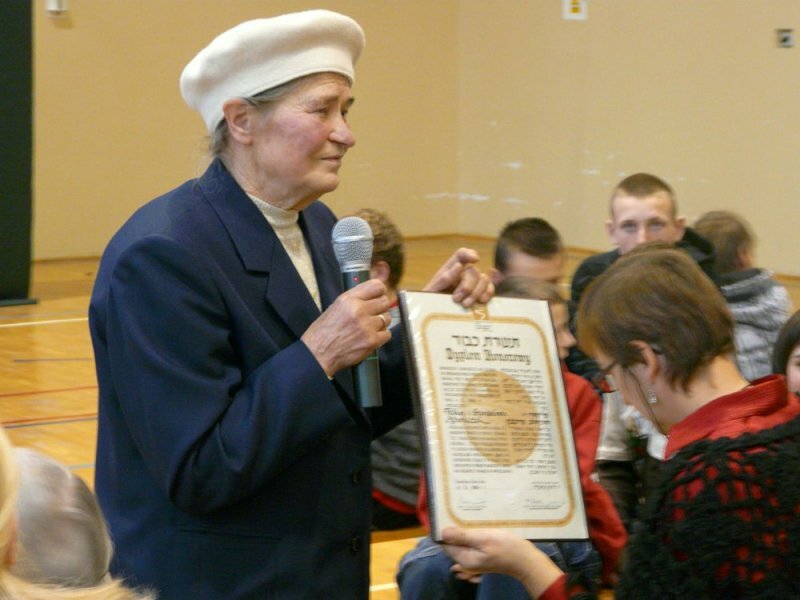 At the Private School of Creative Activity in Zielonka there took place a meeting between the students, Teresa Podolak – daughter of the Righteous among the Nations of the World Eugenia and Jerzy Latoszyński – and Zbigniew Niziński. The students heard the story of rescuing a Jewish boy by the Latoszyński family, as well as the Lasting Memory Foundation’s actions for commemorating the war victims. In a School Complex in Dołha, Zbigniew Niziński delivered a lecture on commemorating the people and places of the common history of Poles and Jews. The students were familiarized with the figures of Poles with the titles of the Righteous among the Nations as well as with the Jews who had survived the Holocaust and the graves of the murdered victims commemorated by the Foundation. Zbigniew Niziński also told the story of both the life and extermination of Jewish families who used to live in the neighborhood. In the Education Development Center in Sulejówek, during a training included in the project "Memory for the future" and attended by teachers from schools all over the country, Zbigniew Niziński delivered a lecture on searching and commemorating the Holocaust victims as well as people who had lost their lives rescuing Jews. As part of the lecture, he displayed photographs presenting the Foundation's activity. Trzydnik Duży – November 15, 2015. Gorajec Zagroble – November 15, 2015.